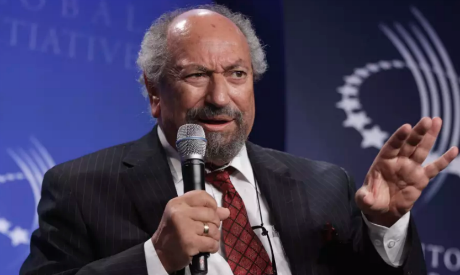 A controversial Egyptian sociologist, Saad El-Din Ibrahim, was deported back to Egypt from Lebanon on Friday over giving a lecture in Tel Aviv last January. A security source said that police at Cairo International Airport had been informed of Ibrahim’s arrival as a deportee from Beirut before he arrived. However, upon arriving in Beirut he was refused entry by the Lebanese authorities per Lebanon's law due to a visit to Israel in January, where he gave a lecture at Tel Aviv University, Ibrahim told authorities. Under Lebanon’s Israel Boycott Law, "agreements made either directly or through any intermediary party with institutions or persons having residence in Israel, or with persons or entities acting on behalf of Israel or its interests, are forbidden." A violation of the law, promulgated in 1955, may result in the imposition of criminal penalties, which could include imprisonment and fines. The security source added that that the authorities informed Ibrahim that he has been accused of squandering funds in five cases, and instructed him to undertake necessary appeal measures, before dismissing him. In January 2018, Ibrahim came under fire for delivering the lecture in Tel Aviv; Arab Palestinian students staged a protest against Ibrahim, accusing him of “treason", according to Al-Ahram Arabic news website. Founded in 1988, the Ibn Khaldun Centre for Development Studies says it specialises in advocating for democracy and civil freedoms in Egypt and the Arab World.